When Mom and I woke up in the morning, we made plans. By the time we were leaving the house, the plans had totally changed. We first decided to stop at a gold buying show that was at a hotel in Seekonk. Once we found out that our stuff wasn't worth anything, we unhappily got back into the car and tried to think of a place to have lunch. 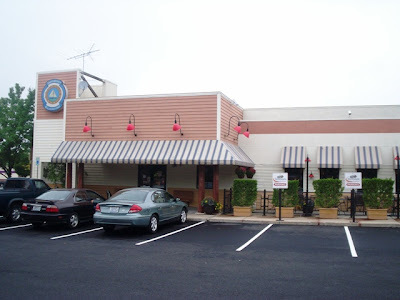 Mom came up with Davenport's, which has their East Providence location just over the Seekonk line. 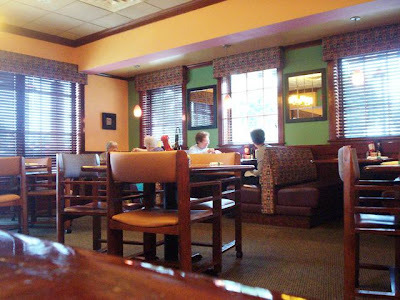 We had been there twice before and had enjoyed it immensely, so our frowns quickly turned upside down when we finally pulled into the parking lot at around 3:30 p.m.
After waiting at the hostess station to be seated, we were quickly greeted by a friendly girl who asked us if we would like a table or booth. We chose a table, so she brought us into a small dining room with tables that had chairs with wheels on them! Mom kept trying to figure out a way to sneak four of them out of the restaurant without being noticed. They were awesome! The hostess left us with two large, colorful menus for us to peruse. She also told us that our waitress would be with us in a moment. When we finally met her, both Mom and I were a little unnerved at how aggressive she was. She wasn't necessarily mean, but she just came on a little strong. When this waitress, whose name we will keep out of the review, asked us what we would like to drink, she seemed a bit disappointed to find out that we only wanted Diet Cokes. I guess in her mind no liquor equals less tip. Too bad! While she was taking our drink order, she also suggested that we order an appetizer. Since we barely had time to open the menu (we had been focusing on the novelty drink and dessert booklet), Mom came out with, "Well, we didn't really have a chance to look at the menu yet." With a blank stare, the waitress took off to get our drinks. Mom and I just glanced at each other. We hope the weird vibes that we were getting would go away soon. Davenport's has a very cute and contemporary interior. The print fabric on the booths and curtains really stands out against the solid colored walls. The dining rooms are well lit so that you can see what you're eating, and the bar area looked very state-of-the-art with a large flat screen television hanging overhead. The menu at Davenport's is quite extensive, serving everything from cheese pizza ($6.29-9.29) to Norwegian salmon ($14.99). Since Mom was having a yen for fried [mozzarella] cheese sticks ($6.99) after watching Giada De Laurentiis make some from scratch on her show, we decided to order some when our waitress came back, which made her happy and gave us another minute to look over the menu and decide on an entree. I don't know why, but Mom and I felt rushed. Again, I think this was due to the aggressive attitude of the waitress. She was always right there waiting for us to decide. It was a bit intimidating. Back off! Dining out is supposed to be relaxing. 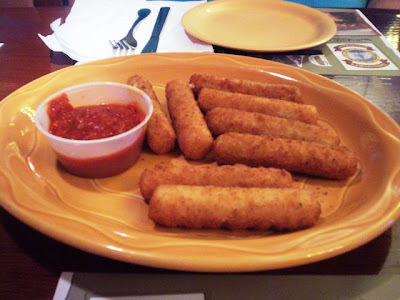 When the waitress returned with our sticks, both Mom and I were surprised to see eight of them on the plate, accompanied by a cup of marinara sauce. At this time, we were ready to place our order. I chose the Tuscany panini ($9.49) with my choice of regular fries (I could have had curly), and Mom went with the turkey club with no tomatoes ($8.49) on her choice of rye bread, also with regular fries. After the waitress left the table to put in our order, we were able to taste our sticks in peace. As I type this, please note that Mom is in the background saying, "I miss them." The marinara sauce was warmed, which we both enjoyed. The sticks were delicious and had a crisp coating, while the mozzarella cheese inside was fresh and melty - just as it should be. This really satisfied Mom's fried cheese craving, and it was a lovely way to kick off our lunch. As soon as our waitress noticed that our last cheese stick had been removed from the platter, the empty plate was gone. Was she hiding in the distance, waiting for us to finish? Yikes. Anyway, it didn't take long for our main meals to arrive. Both plates were decorated with a lettuce leaf and looked lovely, although mine had a crusted stain on the edge (you may be able to see this in the picture). I'm sure it was just an oversight, but for some reason it stood out. I wasn't about to say anything because my sandwich looked so good that all I wanted to do was dig in. 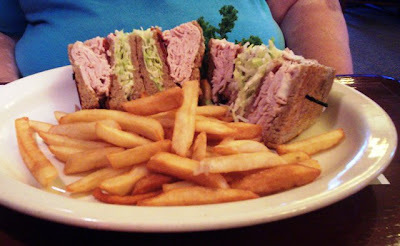 Mom's turkey club was presented beautifully on toothpicks holding all of the little sandwich triangles together. She was very glad to have been given the option to choose rye as her bread, since it is her favorite. The turkey used in the sandwich wasn't a processed meat. It was fresh, roasted turkey cut right from the bird and was very tasty. In addition, the lettuce was crisp, the bacon was meaty, and there was just enough mayonnaise. Mom said it was a perfect club sandwich minus the requisite tomato (she's not a fan). It was so big that she had to wrap up her second half to go. 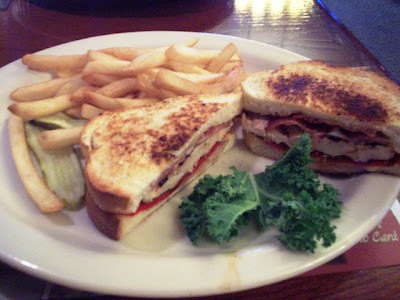 The sandwich came with a good portion of fries which were hot, crisp, and definitely tasted homemade. My Tuscany panini was terrific and had a ton of flavor. Nestled in between two lightly buttered pieces of thick toast was grilled chicken, sliced prosciutto ham, basil, roasted red peppers, and Davenport's garlic herb spread. Everything was extremely fresh, served piping hot, and the ingredients complimented each other perfectly. I also enjoyed the taste of the crispy homemade fries and the two pickle slices that accompanied them. Even though our waitress had weird ways, we still left $38 for her, which included a 20% tip. After all, she did do her job, but like clockwork, she returned to the table as we were counting out the change for her tip, and stood around waiting until Mom had put the money into the bill holder. She quickly took it away, never to be seen again. Geez! She definitely went out with a bang. Before leaving, Mom and I stopped at the restroom, which is conveniently located right by the entrance. It was both clean and organized. As we left Davenport's, both Mom and I spotted the patio area, which had been closed due to inclement weather. Perhaps on our next visit we will get to sit outside. 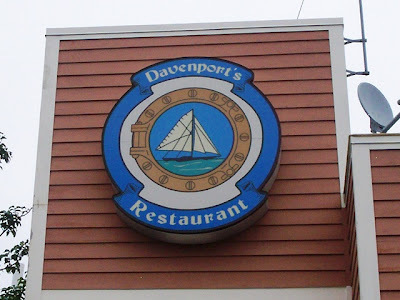 Either way, we definitely know that we will be on the receiving end of a great meal, as we have been on each visit to Davenport's. The service was a bit off today, but the food definitely made up for it. The East Providence Davenport's is open from 11 a.m. to 10 p.m. Sunday through Wednesday, 11 a.m. to 10:30 p.m. on Thursday, and 11 a.m. to 11:30 p.m. on Friday and Saturday (with bar open until midnight).